New Dehli in March 1947. The huge and stately Viceroy's Palace is like a beehive. Its five hundred employees are busy preparing the coming of Lord Louis Mountbatten, who has just been appointed new (and last) viceroy of India by prime minister Clement Attlee. Mountbatten, whose difficult task consists in overseeing the transition of British India to independence, arrives at the Palace, accompanied by his Edwina, his liberal-minded wife and by his eighteen-year-old daughter Pamela. Meanwhile, in the staff quarters, a love story is born between Jeet, a Hindu, and Aalia, a Muslim beauty. Things will prove difficult - not to say very difficult - both on the geopolitical and personal level. More details of Viceroys House on wikipedia. Original Viceroys House DVD released by Big Music comes in 1 disk DVD pack. DVD having 3 Subtitle. While processing the order, we bubble wrap the DVD in its original packing and send it in sealed plastic or carton pack. 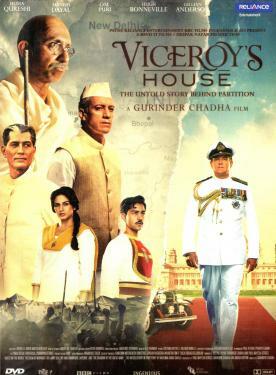 We don't offer download of the Movie Viceroys House, nor we send free poster of the Movie along with its DVD order. We also don't offer free wallpaper or song download of the Movie. Poster and other accessories of the Movie can be purchased separately. Buy English DVD Viceroys House and watch them at the comfort Of your own home. Online shopping Viceroys House DVD, Buy Viceroys House DVD, purchase original English DVD of Viceroys House. Online store to buy Viceroys House DVD	, online DVD store india, buy English DVD, watch English movie Viceroys House videos online. We don't offer DVD renting for English movies online, Buy Original Viceroys House DVD @ discounted and cheapest price online in India.